The medina of Tétouan was rebuilt by the end of the 15th century by refugees from the Reconquista (reconquest of Spain, completed by the fall of Granada in 1492), when the Andalusian Moors first reared the walls and then filled the enclosure with houses. The city is situated in the area of Morocco which was formerly ruled by Spain. It had a reputation for piracy at various times in its history. Tétouan has also been home of an important Sephardi Jewish community, which immigrated from Spain after the Reconquista and the Spanish Inquisition. The Jews lived in a mellah, separated from the rest of the town by gates which were closed at night. Many of the houses belonging to aristocratic families, descendants of those expelled from Al-Andalus by the Spanish "Reconquista", possess marble fountains and have groves planted with orange trees. Within the houses the ceilings are often exquisitely carved and painted in hispano-moresque designs, such as are found in the Alhambra of Granada, and the tile-work for which Tétouan is known may be seen on floors, pillars and dados. The Medina of Tetouan was the second goal of our 2017 WH Travellers Meetup. This Moroccan city can easily be reached on a day trip from the Spanish south coast. We did so by taking an early morning ferry from Algeciras to Ceuta, and then moved on by a pre-arranged minibus to Tetouan for the final 40km. Crossing the border proved to be easy for pedestrians, although the Iranian visa in the passports of some of our group raised a few eyebrows. Tetouan always has been culturally close to Spain. The city derives its character from the arrival of Spanish-Arab refugees at the end of the 15th century, when the last Jews and Muslims were expelled from Andalusia. Later on it even was the capital of the Spanish protectorate of Morocco (1913-1956). A reminder of that is the early 20th century church at the Moulay el Mehdi square in the modern part of town, where we were dropped off by our driver. A guide took us from there through a lively shopping street, until we arrived at the Hassan II square. This is fully fenced off, as to not get too close to the Royal Palace that is the prominent feature of this square. The old city starts right behind the palace, and that’s probably were we entered the core zone of the WHS. It isn’t 100% clear which parts of Tetouan are actually included, thanks to probably the worst map ever available on the UNESCO website. But by comparing it to for example this city map, it looks like it's limited to the area within the old city walls. The medina is full of market stalls, with honorary mentions for the displays of fresh fish surrounded by cats and the ample supply of live chickens. Berber people in traditional dress are also frequent sellers and buyers here. 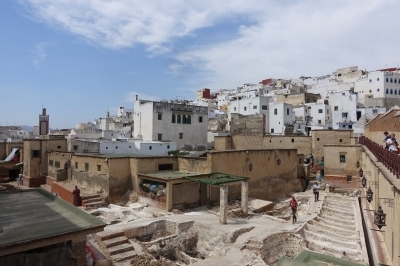 A special part of the old city is also the mellah, the former Jewish quarter. Tetouan had a large Jewish population until the foundation of Israel and immigration to other Western countries. They lived in a separate part of the medina. 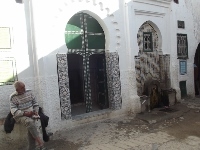 The synagogue is still there, but with the reportedly only 8 remaining Jews in Tetouan it will no longer be in use. This quarter furthermore stands out due to the enthusiastic use of colour. 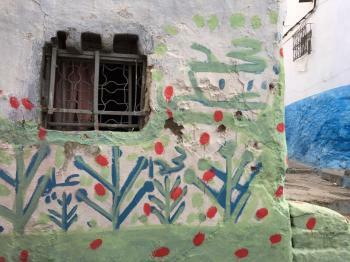 The white walls dominating the entire city of Tetouan are partly painted in green, yellow, blue and pink. The final part of the old city that we visited was the kasbah, a fortress within the old city walls having its own gateway. Now it is mostly in use as an additional souk. We experienced little hassle from sellers or touts during our tour of the medina - maybe because we were in the company of an official guide. Or because the tourist police are quite active here: some of the members of our group claimed that we were constantly being followed by an "inconspicuous" plainclothes police officer. Our tour ended at the Blanco Riad, where we had a lovely lunch and were welcomed warmly (they also had arranged the driver and the guide for the day). The Medina of Tetouan resembles the ones in Marrakesh and Fez, and one sometimes wonders why Morocco has included so many medinas in its proposals. When you visit a couple of them in a row the attraction wears out. But for an isolated day trip Tetouan proved to be worth it. The really big sights and former wealth (which are present in Marrakesh and Fez) are lacking here, but the atmosphere feels more authentic than at its southern counterparts. It’s quite tourist friendly as well: the more important historic buildings do have tiles with a UNESCO sign plus information in Arabic, French and English attached to them. Unfortunately we were not able to get into any of the historic buildings, such as the renovated Medersa Loukach. I visited this WHS in April 2018 as a long day trip from Rabat. Getting there was very easy with straight highway roads. I left very early (around sunrise) to make the most of my time in Tetouan. The landscape of hills and mountains with white buildings stretches well away from the medina area and is immediately visible as you exit the highway. To park your car, there are several private parking lots where you have to leave the key but now there is also a huge public underground parking lot just in front of Place El Feddan and the medina itself. From here, entrance to the medina is only on foot through a myriad of labyrintine narrow hole-in-the-wall alleys. I really enjoyed entering from one side and getting out from a completely different area. 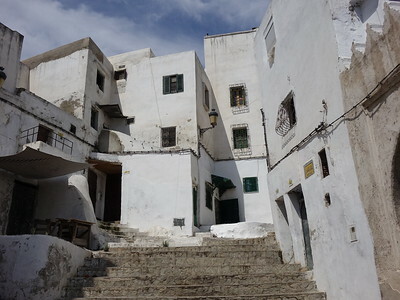 Whenever, I got 'lost' I just opted to walk upwards and deeper in the medina where there are plenty of lookout points over the white-washed houses. After a while, you easily get used to finding your way back to the main streets where all the merchants are. The added colour-coding to the different residential areas is pleasant for photography as it adds colours to the white buildings but it doesn't help that much to finding your bearings. Unlike the other medinas in Morocco, Tetouan doesn't have lavish medersas or iconic minarets. However, the whole ensemble of this lively medina and the contrast between the medina and the colonial buildings in the newer part of town is quite unique. At times, it feels like a journey back in time in old parts of Spain/Portugal/Malta/France. It would be a shame not to visit Tetouan during our travel in Andalusia, Spain. On last day of 2016 we took a ferry from Algeciras to Tangier Med, it is only 90 minutes. There’s no public transport from the ferry port but to Tetouan, so we decide to hire a taxi. We passed through the beautiful Rif mountains and after one hour drive we reach Place Moulay El Mehdi, the best starting point. Our hotel was located in the middle of medina. It’s called Riad Dalia, and this used to be Dfouf family house with an inner courtyard of four columns and arches corresponding to the architecture of 18th century. The views from the rooftop are amazing! And the restaurant – highly recommended; you can try different dishes and taste the real Moroccan cuisine. Just walk around, go to the Casba, see the cemetery and some hammams and mosques from outside (non-Muslim are not allowed to get in). If you reach the old Jewish neighbourhood of Mellah al-Jadid, you’ll see the strong Andalusian influence. I visited Tetouan in 1999 on a guided tour. It was only a short guided day trip into the Medina after 8 days in Spain through a University art tour. It will forever be engrained in my mind. Although I would forgo a tour guide should I visit again, it was spectacular. The sights and sounds as we walked through the Medina...well incredible. Their was a little girl that followed us around for what seemed like miles of weaving amidst the walls. Our tour guide clearly had a mission to get us to a rug shop. If I did it over again I'd do it alone, so I could wander. Doing it over again what would I do different? I'd stop and at least peep into the magnificence of the temples, synagogues, and mosques and stop to talk to the people. Wow, what a magnificent city, full of thousands of years of cultural influences. It really was beautiful and I will never forget the sights and sounds that can only be seen through a personal visit. Travelling from Tangier to Tetouan by bus involved crossing the scenic Rif Mountains. The medina here is quite compact but crammed with the tiled fascades of numerous mosques, medressahs, mausolea and fountains. When I went to Tetouan, it was very windy. It had been awhile since I had last been in a medina and it felt nice to be back. We ran into someone who ended up being a nice guide and showed us all around the medina and gave us a good tour of the medina. He educated us well about Morocco too, and brought us to a nice-looking restaurant to eat traditional Moroccan food. I previously heard Tetouan has a small medina, but that was not the impression I got. Tetouan is also not as dirty as I heard it was. There is nothing wrong with the site at all, and I had a great experience there. On my first trip to Andalucia I had also ventured for a day trip to Tangiers. I am not sure if it had occurred to me at the time that Tetouan had been within reach from Algeciras. Or if I had known but was too afraid to venture off the beaten path. For years since I had considered Tetouan as one of my stupid near misses. So when Ian proposed this year’s meetup in Gibraltar, I knew exactly what I wanted to do: Cross into Morocco and tick off Tetouan. We quickly agreed to include the site in the itinerary of the 2017 meetup. As a consequence we now have the first meeting to take place in multiple countries (Spain, UK, Morocco) and outside Europe. Philipp and Els did the actual planning and it worked out perfectly fine. Many thanks! Tetouan itself is a pleasant medina. It’s not very touristy. We only met one larger group roaming the narrow streets of the medina. The medina primarily serves as market for the local populace with very few souvenir shops. As such you will probably get a more authentic Moroccan experience than in places such as Fez or Marrakech or in nearby Tangiers. Personally, I also liked the colonial new town. Tetouan was the seat of the Spanish protectorate government of the province and it has plenty of colonial buildings to show for it. The trip left me wanting to see more of Morocco and I will probably go next year. 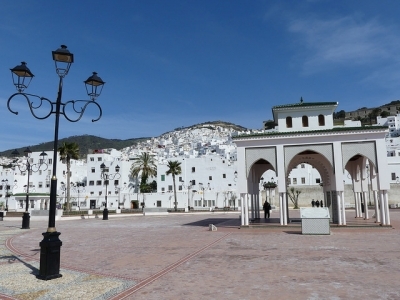 Tetouan is the nicer Moroccan day trip from Algeciras than Tangiers. The city is less touristy and in better state of repairs. It’s also a bit more complicated to arrange. Plenty of ferries run daily from Algeciras port to Ceuta, one of the two Spanish enclaves in Morocco. From the port in Ceuta directly take a cab to the border crossing (charged by meter, 7-8€) and walk across the border. Be prepared to spend an hour waiting at the border, especially if your tour group is made up of globe trotters with exotic visa stamps. You will also be hassled a bit by Moroccan tour guides, but just ignore them. After the border you will find cabs waiting for you. A cab should cost 15€ (or 150 Dirham) one way. In our case we had prearranged for a minibus costing 50€ for the whole group. It should go without saying, but agree on the price with the cabby in advance and don’t enter a non licensed cab. On your return be mindful of the time needed to cross the border back into Ceuta. Plan plenty of buffer. If you have time left (as we did) you can spend it exploring the fortifications of Ceuta and having a last beer at the beach in Africa (and in our case also a first as alcoholoic drinks are in short supply in Morocco). Finally, if you are considering taking your car on a day trip, don’t. The car queue back into Europe at the border is massive. I asked a French car close to the first control and they had been in line for three hours. Luckily, the cabs will just ignore the queue by driving on the left lane and honking. It’s a four lane road, so nothing to worry about. 98 Community Members have visited.